Displaying a slider widget on your front page can give your site a dynamic and vivid look. Sliders are convenient to prominently present important information and display impressive images or very popular content that website visitors will see immediately when browsing through your site. Most of the time sliders are being placed in the upper area of websites and display either the latest posts, carefully selected posts based on topics or featured content. 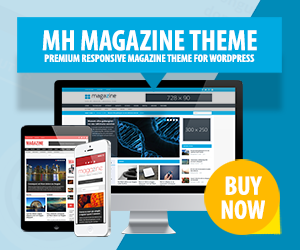 The MH Slider widget which is included in our popular MH Magazine WordPress theme provides great flexibility in several different ways. You may decide where you want to position the MH Slider widget on your website, select the content for the slider or choose between different layouts for the MH Slider widget to select the slider style that suits best based on the content on your website. You have issues with the MH Slider widget? In general, the MH Slider widget is supposed to be displayed in full-width or 2/3 width widget areas like Home 1 or Home 2. However, you can also place the slider in 1/3 width widget areas like for example Home 6 and the widget will adapt accordingly. Depending on the widget area where you place the MH Slider widget into, you can make adjustments within the options of the widget. When you place the MH Slider into a full-width widget area like Home 1, the widget will be shown in full-width across your website, unless you’ve enabled the second sidebar. When displaying the large slider on your website, make sure you have accordingly sized images. To find out the recommended image dimensions for MH Magazine, please see: What are the image dimensions in MH Magazine. In case you would like to place the MH Slider widget into Home 2, you can select the suitable thumbnail size within the options of the widget: Simply switch from Large to Normal under Image size. Please note, when placing the slider in Home 2, you need to place further widgets in Home 6 accordingly, otherwise you’ll have blank space next to your slider. You may also place the MH Slider widget into 1/3 width widget areas, like Home 3, 4 or 6. The widget will then adapt to the smaller widget area and slides will be displayed accordingly. You may determine which posts to show in your slider by making use of the options within the MH Slider widget as you prefer. In general, you may choose to display posts by categories or tags. Please notice that displaying pages is possible if you use the MH Custom Slider widget where you can manually enter content for each slide (up to 5 slides) within the MH Custom Slider widget. The MH Slider widget lets you choose categories with the Select a Category option. By default the option is set to All and you can select whichever category you pefer. If a category is not showing up, then there have not been any posts assigned to this category. After you’ve assigned posts to the particular category, the category will show up in the list as expected. Selecting multiple categories is also possible: First choose a certain category from the drop-down and then add additional categories by ID in the given Multiple Categories Filter by ID field. To find out the specific category ID, navigate to your category list under Posts => Categories in your WordPress dashboard and hover over the category name to obtain the category ID from the URL. To filter posts by tags you need to enter the preferred tags separated by comma. Those posts which are tagged with these tags will then be displayed in the MH Slider widget. Please note that you’ll need to enter the tag slug (the part that is shown in the URL of the tag archive) and not the tag name. For example if you’ve tagged a post with New York, then the tag slug will be new-york. By default, the MH Slider widget displays a short text excerpt for each slide to give readers a first glance of what the article is about. You may limit the length of these excerpts with the particular option within the slider widget. The excerpt length will then apply to all of your slides. The excerpt length can be changed under Custom Excerpt Length in Words within the MH Slider widget. Simply type in your preferred number of words to be displayed as excerpt and save your changes. When reloading your site in your browser, the excerpt length will adapt accordingly. If you do not want to display any excerpts for your slides, you can take advantage of the option Disable Excerpt within the MH Slider widget and disable the excerpt, save your changes and the excerpt will not be displayed anymore within the MH Slider widget. Using the option Post Count you can determine how many posts and thereby slides you would like to display in your slider widget. It is recommended to display only a couple of posts to not overwhelm your audience, however, it is possible to display up to 50 slides if you wish. But please note that the number of posts within the slider widget can negatively affect the load time of your website because the content including the large images needs to be loaded when visitors access your website. It’s recommended to not display too many posts within the slider to ensure that your site is loading fast (up to 3-5 slides within the MH Slider widget is common and recommended). It may happen that you have published some latest posts which should not yet be displayed within your slider widget. For this scenario, you can use the option Skip Posts and select the number of posts to be skipped before the slider is being displayed. For example, if you don’t want to display your two latest posts, you can enter 2 in the input field of the Skip Posts option and the first two posts will be skipped and the slider will start displaying the 3rd post in the query. You can order posts within the MH Slider widget based on various criterias. By using the option Post Order you can determine whether posts should be shown chronological (Latest Posts), randomly (Random Posts) or by popularity (Popular Posts). When selecting posts by popularity, then those posts with the most comments will be displayed, because usually posts with many comments are an indication for quality content that draws lots of attention. WordPress provides you with the option to mark posts as sticky. These sticky posts are supposed to be displayed first as they are being considered as featured. In case there are certain posts which are worth reading in your opinion you can mark them as sticky. The MH Slider widget provides an option to enable or disable sticky posts for the widget. By default and when all categories are selected, the MH Slider widget displays sticky posts first (sticky posts won’t work if you’ve selected a category for the widget). In case you do not want to show sticky posts first within your slider, simply check the option Ignore Sticky Posts in the widget. By ignoring the sticky posts behavior, the sticky posts will still show up in chronological order within the MH Slider widget, but not in first position anymore. If you decide to display posts as sticky within the MH Slider widget, please note that the post count will differ. For example, in case you have set your post count to 3 and have marked two posts as sticky, your slider will display 5 posts in total. When ignoring the sticky posts behavior, your slider will display 3 posts in total as expected. This is because WordPress creates a 2nd query for the sticky posts and this query will be added to the regular query which results in an increase of posts. The MH Slider widget provides several layout options you may choose from. You can select your preferred layout by using the option Slider Layout within the widget. When switching between layouts, content and options you’ve set previously will be kept, only the look and style of the MH Slider widget will change based on your selected slider layout. In case you encounter issues with the MH Slider widget, please have a look at our detailed support article about the slider. This extensive support article helps with the most common issues when using the MH Slider widget and might quickly answer your questions, e.g. Why slider does not show up? Why images in slider resize? Please see: Solving issues with the MH Slider widget. I noticed RTL issues (in my particular case it’s Hebrew language) with the MH Slider widget in the MH Magazine theme where if the title contains a mixture of Hebrew and English words, it does not display correctly. The words are not lined in the correct order. When you open the post, the title displays correctly and in the right sequence. Thank you so much for your prompt response. That indeed did the trick and now the post titles look great in the MH Slider widget as well. I want to have my own custom defined slides and images on the static home page (my Home Page) and the post slider only displays posts. What can I do? Hi George, the MH Slider widget can display articles based on categories or tags. You can filter posts by categories or tags within the options of the slider widget. If you want to display something else, this would be possible via custom development or 3rd party slider plugins. As an alternative, if you’re using the MH Magazine theme, you could make use of the MH Custom Slider widget to display up to 5 custom slides on your front page. Here you can find more information: Difference between MH Slider and MH Custom Slider. How do I set the duration of each image in the slider? Hi Warren, have a look at this: Increase / decrease slider speed. Hello, the MH Magazine slider is not showing on my site even though I have activated it. Hi Rumeo, make sure that you’ve created and set a static front page correctly, selected the Homepage template for your static front page and then place the MH Slider widget into one of the Home widget areas. This is all covered in the theme documentation.